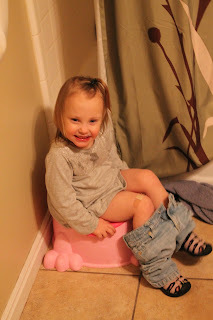 Well, I finally decided to tackle the potty training with child #3. I hate potty training! I hate cleaning up messy pants, I hate not being able to go anywhere because you don't want to have an "accident" in public, I hate having to remind them every 15 minutes to use the potty, But I LOVE the end result. Diapers are SO expensive, and we have been going through a jumbo size pack a week with 2 kids in diapers. Sierra has been doing awesome the last 2 weeks. She is averaging 1 "accident" a week, that I can handle. She is so proud of herself every time she goes in the potty, she gets this look on her face like "I'm so awesome, I just used the potty." Hooray for big girl underwear!!!!! *She loves to color. I will find her in the toy room just coloring to her hearts content. *She has cut her own hair twice, right in the front. It's starting to grow back now so it kinda looks like bad bangs. *She is very independent, wont do anything unless its her idea. *She is so funny. She has her own little personality, and always keeps us laughing. She is such a mimic. Better watch out what you do, because She'll be doing it too before you know it!